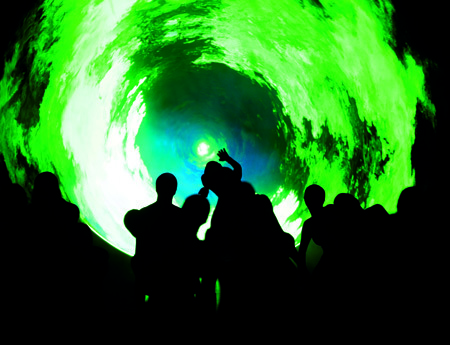 Delivering an unbearable lightness of being – or non-being – with an apocalyptic end (in a maelstrom of green), Wind Shadow was less dance and more a fusion of installation art and kinetics; a visually stunning spectacle sans emotion, sans words, sans context, sans an anchor of any kind. A collaboration between Lin Hwai-min, (Founder and Artistic Director of Cloud Gate Dance Theatre of Taiwan and internationally acclaimed choreographer) and Cai Guoqiang (Director of Visual and Special Effects for the opening and closing ceremonies of the 2008 Summer Olympics in Beijing), Wind Shadow evolved from over a hundred ideas Cai sent Lin, black snow, black waterfall, black rainbow … ideas contained in a couple of words or very short sentences. Cai’s words and phrases, in Lin’s hands, become installation art in lieu of dance; a largely monochromatic mis en scene, eighty minutes of stunning, dramatic, thought-provoking, morbid, disturbing, pleasing, unsullied and then corrupting (or corrupted) fractured, fragmented panoramas and viewpoints. Violence and art (or violence in art ? ), it began innocuously enough, lightly enough, a stark white backdrop framing sculpted, androgynous bodies (humans and shadows) sheathed in black, many masked and faceless. 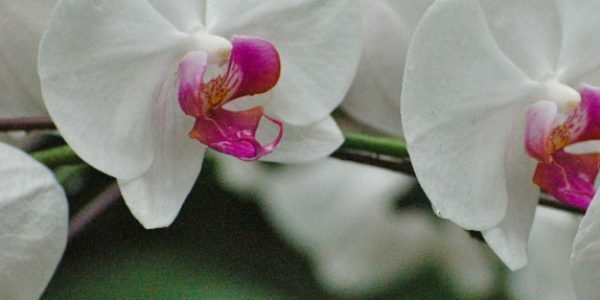 They moved – not danced – in and through darkness and light, the corporeal and the unsubstantial stalking each other, briefly uncoupling and inevitably reuniting, miming and preying on each other, sometimes a heartbeat out of sync. Shadow play, almost, the lighting was dramatic and hard-edged or dreamily translucent, silhouettes and shadows flying slowly fluttering kites. All was well in the ordinary scheme of things between an individual and his alter ego – or good and evil, or dark and light – it was open to interpretation. There was ethereal, gauzy fabric, lots of it (sheer white which slowly turned to smoky black), kites, flags and angel wings (that looked like the Balinese umbul umbul) – billowing, rippling and afloat in wind produced by dozens of fans concealed in the wings. The dancers performed their (sometimes) conflicting, (sometimes) playful duets with their shadows with the utmost economy of motion. It was almost as if the immobile was given life, weightlessly propelled by the invisible and the intangible – moving air and energy. Trained in Qi Gong, meditation, martial arts, modern dance, ballet and calligraphy, the dancers seemed to exist outside their bodies, manipulating them with feather touch control. The malevolence of black slowly seeped in, the figures turned malefic and turned upon each other, movement became erratic and increasingly frenzied and the stage darkened, an oval disc of a mirror with an uneven surface was lowered and it reflected the amoeba-like dancers, seeking, crawling, confused and desperate; (distortions and further distortions) while the sound track changed from subliminal heartbeats and fetal whispers and chuckles to the throb of a dentist’s drill, explosions and gunfire. 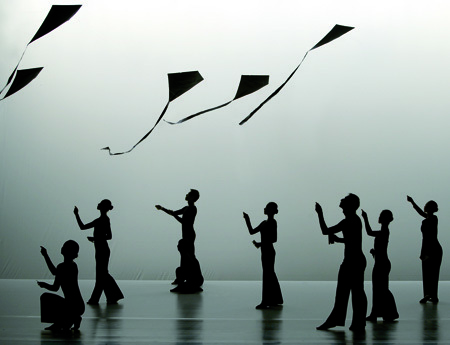 A sudden waterfall of cascading black silk, endless and relentless, and dancers raced around the stage with flags snapping, flapping, and shadows cowered. 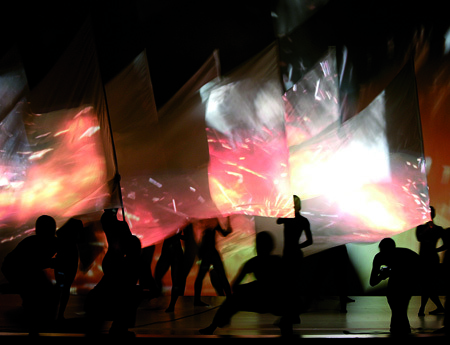 Then began staccato projections of Cai’s gunpowder drawings and explosions, echoing and reflecting off the flags, the backdrop, the walls and the dancers; the images perfectly focused on specific surfaces by crouching dancers wielding hand held projectors. The beatific and the tranquil was subsumed by desolation and despair, bleak landscapes and the terror of approaching annihilation. The inevitable doomsday approached in smoke and haze, light and sound, crazed and stunned beings; in a tempest of black clouds and black snowflakes that fell like malignant confetti, and it arrived magnificently in a breathtaking, engulfing, encompassing tunnel of green – a spectacular use of sulphur-lit smoke and projection to create a vortex that extended beyond the stage and into the theatre, sucking the audience into its terrible, hungry epicenter. And the black snow continued to fall as the lights dimmed and the curtains descended. Lin Hwai-min has won a slew of international awards including the Ramon Magsaysay Award. He was honored as one of Asia’s Heroes by TIME in 2005. Cai is famous for his use of gunpowder and pyrotechnics, and according to the programme notes, is a bold originator of new art forms whose basic material is gunpowder … his drawings and site-specific ‘explosion events’ demonstrate a spectacular fusion of the science and art of transformation … the processes of destruction and change as radical conditions for reality … and creativity. In a post performance discussion immediately after the show, Mr. Lin Hwai-min took questions from members of the audience with exquisitely polite, acerbic, wry, dry and sometimes impatient wit. He readily admitted that there was no story. The shadows were metaphorical, allegorical; the images without literary reference or context as words were limiting. If you have a plot and characters, movement is needed to convey the meaning of the story. I read things in energy and my dancers are freed from serving a character or a plot. They are just themselves, free to express through pure movements. Though not intended as a political statement, Lin pointed out that today’s world is one of violence, unrest and conflict and everything has political inflections. Each person has to travel along his own path as a human being, and live as fully as his conscience instructs. They were there near the Esplanade taxi stand, Lin’s faceless, nameless, impassive living sculptures, just a group of young men and women in Converse and cargo’s, bulging haversacks and mobile phones to their ears. I complimented them, and a couple of the boys replied with a gracious Thank You, but I will remember the moment when a statue smiled, the stark contrast with that young girl who was centre stage through most of the performance, a smile of incredible beauty and acknowledgement. Previous Post Is your python bigger than mine ?